The painless, no-downtime procedure popular with the stars. You'll be hooked after one treatment. The Houston area’s only provider of the Hollywood Laser Peel – recently featured live on the Fox 26 Morning Show! Have you ever wondered how Hollywood stars’ complexions look so fresh and glowing on the red carpet? Well, the secret’s out – it’s called the Hollywood Laser Peel (aka Spectra Peel) and it’s now available at Inkfree, MD Laser Clinic in Houston. [See our live TV feature on the Fox 26 Morning Show below]. This painless, no downtime carbon laser facial provides a host of skin rejuvenation benefits and is a treatment that can either be done just before a big event or as part of a regular skin rejuvenation regimen. Got a wedding, a prom, a graduation or another big event to get ready for? This treatment is perfect for you. The ‘peel’ is performed instantly by the laser, so no hiding in the closet for several days as with chemical peels – all you’re left with is beautifully soft and glowing skin. The more you do it, the more benefits you get. That’s why it’s so easy to get hooked and to keep coming back for more. Find out why our patients are so excited about the Hollywood Laser Peel. What can the Hollywood Laser Peel do for me? The Hollywood Laser Peel™, also know as the SPECTRA™ Peel or Carbon Laser Peel is a no-downtime laser facial that helps rejuvenate the appearance of aging, damaged skin. It evens skin tone, reducing the appearance of pigment, fine lines, and acne scars. Skin instantly looks and feels younger. It has long been a favorite of celebrities such as Angelina Jolie and Kim Kardashian before red carpet appearances as it is a great way to get a quick skin refresher without the longer downtime associated with chemical peels and other laser procedures. How does the Hollywood Laser Peel work? A light layer of SPECTRA™ Lotion, a carbon-based lotion, is applied over the skin giving the appearance of a mud mask. The laser will be passed several times over the area being treated, first heating up the lotion then removing it along with the top layer of dead skin. The heat from the laser also causes the skin to contract while at the same time stimulating the building of collagen which improves skin elasticity. This superficial peeling removes excessive sebum, exfoliates the upper layer of skin and unplugs pores, resulting in smoother looking skin. The treatment can be performed alone before an important event but works best when several treatments are done over a period of time. A light layer of SPECTRA™ Lotion, a carbon-based lotion, is applied to your skin and needs to set for 10-15 minutes. The first pass of the laser sets the carbon onto the skin. You will hear snapping sounds when the laser is fired and will feel a slight tingling or warmth as the laser removes the carbon, along with a very fine layer of skin (the peel). The entire procedure is 30 minutes or less. Is there any downtime? Does the Hollywood Laser Peel hurt? With no downtime and minimal side effects, you may immediately return to your daily activities. Your skin will be smoother and glowing, so it is the perfect treatment to have before a big event. The majority of patients report zero pain, they only experience a slight warming of their skin and a light prickling or tingling feeling. Treating aging skin is an ongoing struggle for all of us. The Hollywood Laser Peel is such a gentle procedure that you can have one time or regularly (monthly). 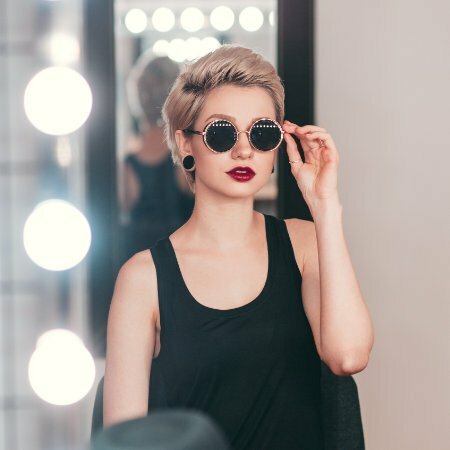 With no downtime, you can stop by for a Hollywood Laser Peel before special events such as weddings, proms, graduations, and major parties to ensure that you look your best. At Inkfree, MD we will recommend a treatment course that is right for you. Is this treatment good for men too? Absolutely. Men have skin and want to look good too! Since our female-to-male patient ratio is very close to 50-50 across all of our laser and skin care treatments, we have developed a special variant of the Hollywood Laser Peel called the ‘Carbon Laser Peel for Men’. The Carbon Laser Peel for Men is an expanded version of the Hollywood Laser Peel and includes extensive focused treatment of the full beard area. 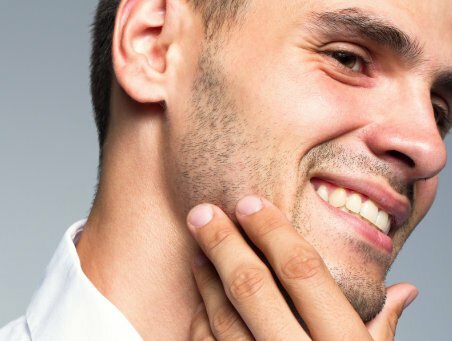 Clean-shaven guys beat this area up almost every day and often are plagued with issues such as in-grown hairs, lines, pimples, and rashes. Removing the tiniest top layer of skin, reducing pore size, reducing wrinkles and stimulating collagen will dramatically help to rejuvenate the neck area + this includes all the other facial benefits of the Hollywood Laser Peel. The response for this treatment from our male patients and the results they’ve been getting are amazing. How much do Hollywood Laser Peel treatments cost? Individual Hollywood Laser Peel treatments are $199. As with most of our treatments, significant package discounts are available. Hollywood Laser Peel packages are available in quantities of 3 or 5 treatments. Also, a NEW monthly membership plan is also available. If you are in the Houston area and would like to discuss your Hollywood Laser Peel or Carbon Laser Peel for Men treatment options, please call Dr. Adaeze Okeke (Inkfree, MD Laser Clinic) at (832) 478-5669 to schedule your free consultation. This post has been sponsored by Lutronic and InkfreeMD. As always opinions are fabulously my own.] Awards season is over and MAN was I blown away by the youthfulness at the Oscars! Yes, they are celebrities but what kind of vampire pills or crazy beauty regimes are they implementing? Dr. Adaeze Okeke, Inkfree, MD Laser Clinic and all staff are available to discuss your treatment needs. We offer FREE consultations for all of our laser and skin care treatments. Providing SAFE, EFFECTIVE & AFFORDABLE treatment solutions is the foundation of this physician/family-owned and operated laser clinic in Houston. We are in the life-changing business and we love it. Upon submitting this form, a member of our staff will contact you shortly to schedule your appointment. Feel free to call us at (832) 478-5669 with any questions or appointment requests.